It’s well known that big cities frequently get snookered into using taxpayer funds to build professional sports stadiums and convention centers that turn out to be financial disasters. The same thing has been happening with entertainment arenas built by smaller cities, and one company is behind many of the deals. 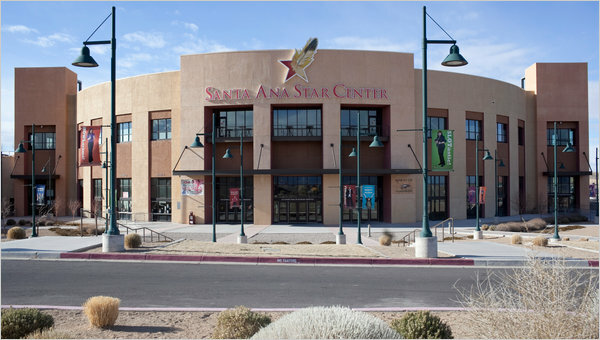 This was recently brought to light by the New York Times in an article about Rio Rancho, a suburb of Albuquerque, whose leaders were persuaded by the company, Global Entertainment, to build the Santa Ana Star Center a decade ago. The arena, to be operated by Global Entertainment, was designed to be the anchor of a new city center that would boost economic activity in Rio Rancho. Yet soon after the arena opened in 2006, it became obvious that the financial projections were wildly unrealistic. The 6,500-seat arena turned out to be too small for big events and too big for smaller performances, and it had difficulty competing with Albuquerque’s venues. As a result of these and other problems, the facility soon began racking up heavy losses, and in 2009 the city fired Global Entertainment and sued it over unpaid bills. Arena-related costs squeezed an already tight municipal budget, forcing Rio Rancho to eliminate jobs. The Times notes that numerous other arenas promoted by Global Entertainment have run into similar difficulties, with the company getting ousted. Yet it goes on making new deals. When will public officials learn that entertainment and hospitality projects are usually not suitable investments for taxpayer funds?